Whether he’s climbing in the Himalayas or writing from LA, Chris Brinlee Jr. is an adventurer and storyteller who just can’t stay put. As a Cotopaxi ambassador, he regularly puts their gear and apparel through the paces on each adventure. As a writer and photographer for outlets like Outside’s new outdoors lifestyle column, IndefinitelyWild, he then shares those stories with the world. Follow his adventures on Instagram. Recently, we caugh ups with Chris and had the chance to find out what’s been occuping his time, and what gear he finds most useful in the wild. Gear Institute: Hey Chris! Great to chat with you. Can you tell us what you’ve been up to lately? Any big adventures coming up on your schedule? Chris Brinlee: This year has been non-stop so far; it’s not letting up anytime soon. I just got back from British Columbia where I did some skiing, sledding, and shooting. The rest of my month is booked up with adventures involving everything from airplanes to motorcycles to G-Wagons from LA to Zion to Alberta to Sun Valley; hiking, skiing, and climbing in-between. GI: Sounds like you’re staying plenty busy. What are some pieces of gear that you always take with you when traveling? CB: I regularly need to maintain charges on a handful of electronic devices including my phone, GoPros, GPS watch, and headlamp; the Goal Zero Venture 30 is my go-to for that job when on the move. It holds 7800 mAh of juice; and it’s waterproof. That makes it hard to beat. You never know when the weather will turn to crap, so I always pack a few Hyperlite Mountain Gear cuben fiber stuff sacks in various sizes wherever I go. They help keep my gear organized and dry without much expense in the way of weight. I travel a lot; so a good multi-function watch is an invaluable piece of gear. I’ve been using the Suunto Ambit 3 Peak for a while now. Dual time, countdowns, and alarms are useful for keeping track of what’s going on in life; an altimeter HR monitor, and metrics measurable by GPS are invaluable on adventures. Having water is always crucial—whether traveling, on an adventure, or at home; the LifeStraw Go ensures that my water is always safe to drink thanks to its built-in filter. No worrying about treatment pills or chemicals or pumping. Just fill and go I take this thing with me everywhere. GI: And what gear from your sponsors really stands out? Is there anything you don’t leave home without? CB: I’m really excited about a lot of the new and upcoming gear from Cotopaxi; this stuff is always on me or in my pack. The Samburu Pants are a lightweight, stretchy softshell pant that looks great around town and function well in the outdoors. They pair perfectly with the Tolíman Pullover, which uses the incredibly warm yet breathable Polartec PowerWool. I’ve barely taken either of those off since I got ‘em. 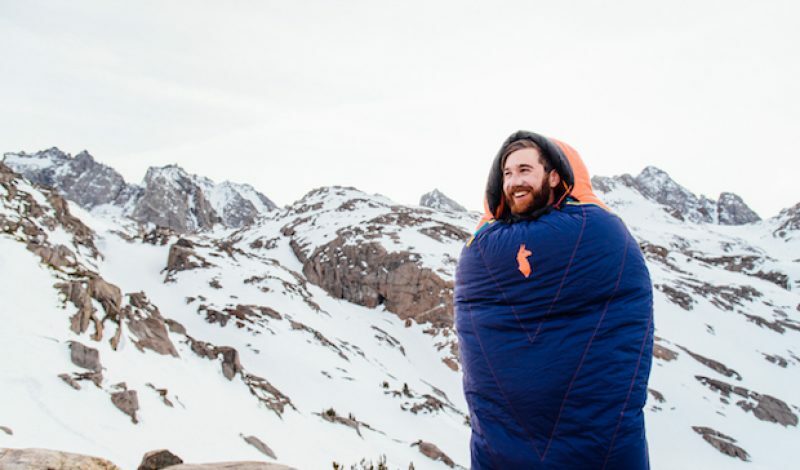 Cotopaxi just released their first sleeping bag—the Sueño— which I’ve really been enjoying too. Ultralight pundits would scoff at the 2 lb 13 oz, 15-degree, 800-fill ethically-sourced down bag, but it’s got some cool and useful features like a built-in pillow sleeve, full zip through the footbox (which enables it to be used as a blanket, or while walking around,) and additional half side zip (which allows the front to be folded over for max venting.) Plus the colors are a ton of fun. My go-to pack for backcountry adventures has been the Nepal 65L—a fully-featured pack that’s capable of hauling around heavy loads, but I’m even more excited for the new 75L version of the pack to hit the market. The 75L is much more adjustable; it’s features are even more refined than those of the 65L. Plus the colors are awesome. A big part of my role is photographer, so on all of my adventures, I carry around a Nikon D750 (slightly lighter and faster than the D810, but with similar image quality) and a GoPro or three. A Hero4 Black for epic high-res timelapses and slow-mo shots. A Session for when I need to get quick and dirty. And a Silver (which has an incredibly useful LCD touchscreen) for just about everything else. Kimera Koffee helps to fuel my adventures; I always brew it fresh using a lightweight and packable SOTO Outdoors coffee helix; drink out of a custom print Snow Peak titanium mug. GI: Are there any special packing or gear-protecting tricks that you use when you travel? Do you have any special packing techniques you use when you are out in the field on your adventures? CB: There aren’t really any packs on the market that are equally well suited for backcountry travel and adventure photography. So what I usually do is carry a dedicated backcountry pack; then just wrap my camera in a jacket or a beanie and stuff it in the top of my pack when not in use. If it is going to rain or if I have to do a stream crossing, I’ll stuff it in an HMG cuben fiber stuff sack. The best option I’ve found for carrying the camera in an accessible position while on the move is with the Peak Design Capture Pro quick release plate. Using that, along with their Slide strap, I can quickly go from shooting to hands-free. GI: What is one gear trend that you are especially excited about or interested in right now? GI: Do you have one favorite jacket or shell you always use, regardless of activity? CB: The Kumari Ski Jacket from Cotopaxi is my go-to hardshell. I use it for skiing, climbing, or anytime I may be bombarded with bad weather. It uses a burly version of Polartec NeoShell, which is probably the best waterproof/breathable technology out there right now. GI: Still on jackets: Hardshell or softshell? Why? CB: Both. They each serve a purpose. If I’m going to be out when the weather is going to be bad, I want maximum protection. That’s usually going to come from a hardshell. If I’m moving quick and really working up a sweat, a softshell will probably transfer that moisture better while still offering a decent amount of protection. We agree Chris! Thanks for taking some time to answer our questions. See you out on the trail.